Unfortunately, there are thousands of children in the US and surrounding Carribean areas that have been dealing with horrific disasters from Hurricane Harvey and Hurrican Irma. I can’t even fathom how the families are dealing with going home to nothing. Seeing the Florida Keys on the news this week just broke my heart. 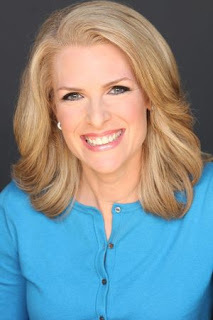 Janice Dean, a senior meteorologist at Fox News Channel, has created Freddy the Frogcaster and a series of books dealing with weather issues including FREDDY THE FROGCASTER AND THE HUGE HURRICANE as well as others. 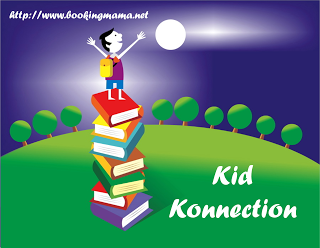 Maybe your children are watching the news and scared by the severity of the disasters, this series of books may be a way to explain to them what is happening and how to be prepared if a blizzard, tornado, flash flood, or hurricane comes to your area. Freddy loves frogcasting the weather. His fellow frogcasters, Sally Croaker and Polly Woggins (awesome character names) love talking weather with Freddy. After a drought, Freddy noticed a storm was heading their way. He was worried that the ground was too dry to soak up all the rain and warned their listeners in Lilypad to prepare for flooding. But, the storm went North and Freddy’s frogcast was wrong. Will the residents of Lilypad believe him the next time he warns of a flash flood? Freddy received much ridicule and teasing after warning about the flood the first time. Much like many of us have done to our own meteorologists. Even though Freddy and his fellow frogcasters know he did the best he could with the information he had, Freddy still worries that residents won’t listen when a new storm is coming with even more rain. As residents deal with flooding, the frogcasters are there to report and make sure everyone is safe. After the story, Dean takes parents and readers through the basics of what is a flood, what the different warnings mean, and how to prepare if a flood or flash flood happens in your area. Russ Cox has created some really adorable characters in these Freddy books. Even though what happens in the story is scary, he portrays the scenes in a way that kids can understand the danger. He shows homes and cars in the flood, but not people. 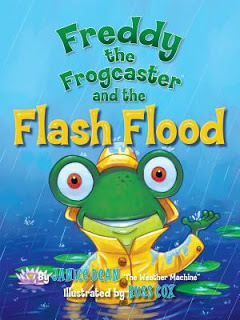 He shows through his illustrations that flooding can be dangerous and it is important to listen to the weather alerts. I think these would be great for home or school lessons about the weather. I haven’t read the other Freddy books, but if I had young children, I would totally be buying all of them. UPDATE: For every copy of this book that is sold, Janice Dean will donate the proceeds to Hurricane relief. Click HERE for article. Janice resides in New York with her husband and their two sons. For more information, check out the Freddy the Frogcaster website, HERE. 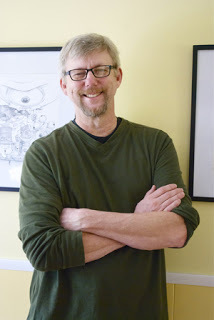 Russ has illustrated all of the Freddy the Frogcaster books. He opened his own studio Smiling Otis Studio where he presently specializes in illustration for the children’s market and children’s books. Russ and his wife live in Maine with their three cats. See all the other Freddy books, HERE. Thanks to the publisher for providing a copy of this book for the purpose of this review. This review is my honest opinion. If you choose to purchase any of these books through the above links, I may receive a small commission without you having to pay a cent more for your purchase. Thanks for supporting SincerelyStacie.com. That sounds like a great book to reassure kids. The cover is adorable!